Since reading The Curiosities by Maggie Stiefvater, Brenna Yovanoff and Tessa Gratton I have had a thing for short stories. I’m always impressed at the characterization that can occur in just a few short pages. Lips Touch Three Times by Laini Taylor is a collection of three shorts stories: Goblin Fruit, Spicy Little Curses, and Hatchling. Goblin Fruit was the first story it was also my least favorite. It was about a girl whose family is quite strange. The family warns her that goblins are trying to tempt girls to sell their souls and that once you get their fruit you’re a gonner. Despite this knowledge the girl falls for the new different, swoony, boy. The story itself was well written, as is the entire book, but it just felt too cliché. Spicy Little Curses was my favorite story. Set in India following World War I it was about an English girl, living in India, who is cursed to never utter a word or else everyone in earshot will die. I loved the way the magic of the story straddled the real and paranormal worlds. Magic like this, where the story reads contemporary but also has a paranormal element is my favorite kind. Hatchling was the longest story, it comprised around half of the book. Because this story was longer it had the best characterization. I loved getting to know Esme and her mother. As I was reading though I discovered that Hatchiling was really two stories, that of Esme, and of her mother. Hmm…that oversimplifies things…I guess really Hatchling was about the Druj, creatures who are very like faeries. They kidnap children, take offerings in the forest, and like to be kind of mean and spiteful. This story entranced me with its magic and deeper question of what it means to have a soul. I will say though that at times while I liked the little details they became a bit overdone and rather overwhelming. If this was an entire novel I would have liked it more, but because it was a short story a lot of the extra filler could have been left out and it would have made the story tighter and stronger. 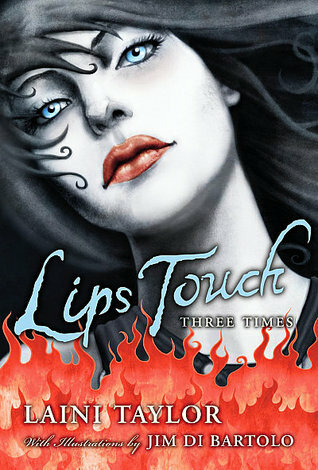 Overall, I enjoyed Lips Touch: Three Times, they were three well written stories that kept my attention. I also adored the illustrations by Jim Di Bartolo that were at the beginning of each story. His art is gorgeous and really helped set the mood for each story. Glad to hear you enjoyed these stories. I agree her writing is gorgeous so I will have to check this one out some day soon! OMG!! I Love Jim Di Bartolo's art! It's just AMAZING!! And how awesome is it that both husband & wife are so damn creative! Laini Taylor is just a brilliant writer. I've had this book forever and have wanted to give it a try. To be honest, Laini Taylor is one of those authors that greatly intimidate me. Her writing blows my mind, so reading her books can be overwhelming.